SharePoint provides an exciting opportunity for developers to build mobile apps that travel with users, are interactive and attractive, and are available whenever and wherever users want to work with them. You can combine Windows Phone 8 and Windows Phone 7 applications with on-premises SharePoint services and applications, or with remote SharePoint services and applications that run in the cloud (such as those that use SharePoint Online) to create powerful applications that extend the functionality beyond the traditional desktop or laptop and into a truly portable and much more accessible environment. The new mobility features offered by SharePoint are built on existing Microsoft tools and technologies, such as SharePoint, Windows Phone, Visual Studio, and Silverlight. Developers who are already familiar with those technologies and their related tools will be able to create SharePoint-powered mobile apps for Windows Phone without a steep learning curve. In this section, we explore some of the types of SharePoint-powered mobile apps you can build for Windows Phone 8 and Windows Phone 7 and the most common ways to customize those applications. SharePoint provides a framework and tools for developers, including Visual Studio 2010 project templates, to create mobile solutions that interact with SharePoint data both in on-premises SharePoint installations and in the cloud by using SharePoint Online. Figure 1 shows how a simple list application could look on Windows Phone. What skills do you need to create mobile apps? In this section, we assume that you're familiar with SharePoint, the .NET Framework, the Visual Studio development system, and Visual C#. It's also good to have some experience with Windows Phone 8 or Windows Phone 7 application development using Silverlight, and it helps to be familiar with XAML, the StackPanel and Pivot controls for Windows Phone, and concepts such as tombstoning, Silverlight data binding, and so on. If you are new to Windows Phone application development using Silverlight, we recommend that you check out the following resources. You can build a wide variety of mobile apps using SharePoint. This section describes what's new or changed in the SharePoint release that makes mobile app development simple for developers. This is the simplest type of mobile app you can build to bring a regular list to the phone. SharePoint offers a Visual Studio template to enable you to quickly and easily create SharePoint list applications for the Windows Phone. For example, you can build a "To Do List"-type Windows Phone application that brings your task list from SharePoint into the Windows Phone and enables the you to use your phone to update the status of a task on the go. Another example is having the product catalog for an inventory list in SharePoint available on the phone for the sales people. Installing the Windows Phone SharePoint SDK makes two Windows Phone SharePoint Application templates available to you in Visual Studio 2010 or Visual Studio 2010 Express for Windows Phone (see How to: Set up an environment for developing mobile apps for SharePoint). Using the Windows Phone SharePoint List Application template, you can follow the steps of a wizard to create a functional Windows Phone app that can access and manipulate data in a SharePoint list. SharePoint adds several new classes to both the server and client object models to enable the SharePoint mobility scenarios that we described earlier in this article. To enable location-aware apps, there is a new native field type class, SPFieldGeoLocation, along with several associated classes for structuring the value of location fields and rendering them. These classes are also callable in the SharePoint client object model for Silverlight. The new field type also has a definition added to the standard SharePoint fldtypes.xml file and new user controls for rendering the field on the Display, Edit, and New forms. For an overview, see Integrating location and map functionality in SharePoint. To enable SharePoint authentication for Windows Phone users, the client object model includes a new Authenticator class and several associated classes. For an overview, see Overview of the SharePoint mobile client authentication object model. To enable automatic notifications to Windows Phone users of events on a SharePoint farm, the server object model includes several new classes, each of which is also callable from the client object model. These classes include methods that enable phone apps to register with SharePoint server apps for notifications about specified types of events. There are also methods that the server apps use to send notifications to registered subscribers. For an overview, see Create a Windows Phone SharePoint list app to receive push notifications. In SharePoint Foundation 2010, the client object models provide APIs that enable developers to interact with SharePoint sites from script that executes in the browser, from code (based on the .NET Framework 3.5 or later) that executes in a .NET Framework-managed application, or from code that executes in a Silverlight 2.0 application. The proxy .js and managed .dll files that compose the client object models are built on the client.svc web service, and handle the effective batching, serialization of requests, and parsing of replies. 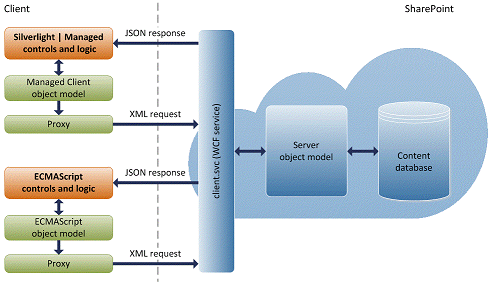 Figure 2 shows a high-level view of the SharePoint client object model architecture. By default, the SharePoint REST service responses are formatted using the Atom protocol, according to the OData specification. In addition, the REST service supports HTTP Accept headers that enable developers to specify that the response is returned in JSON format. To learn more about REST services in SharePoint, see Use OData query operations in SharePoint REST requests.